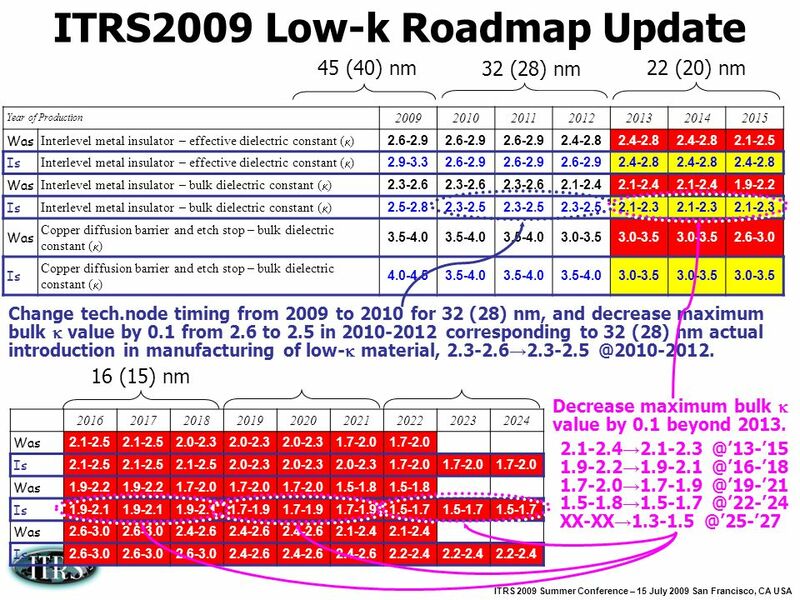 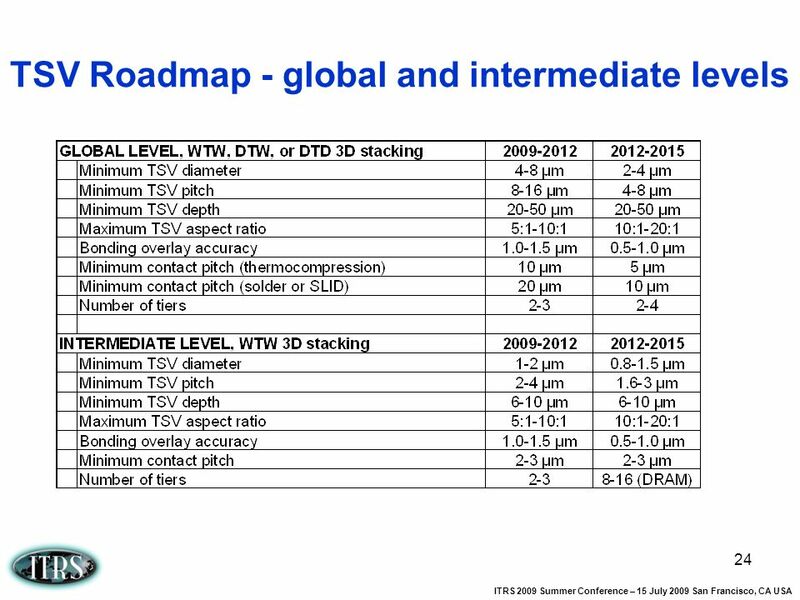 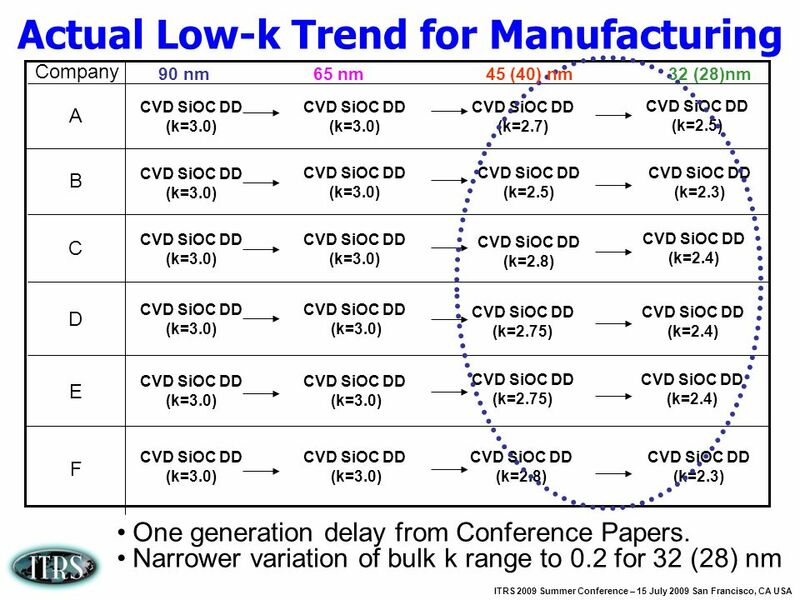 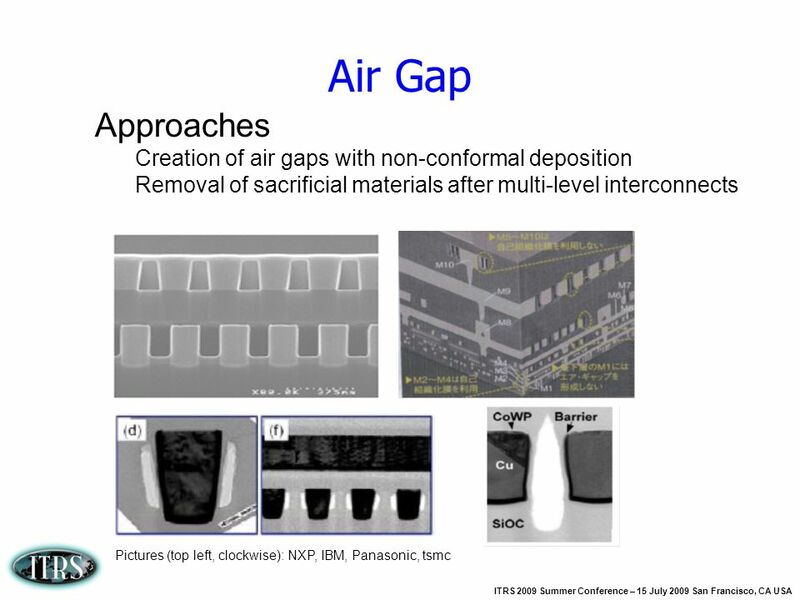 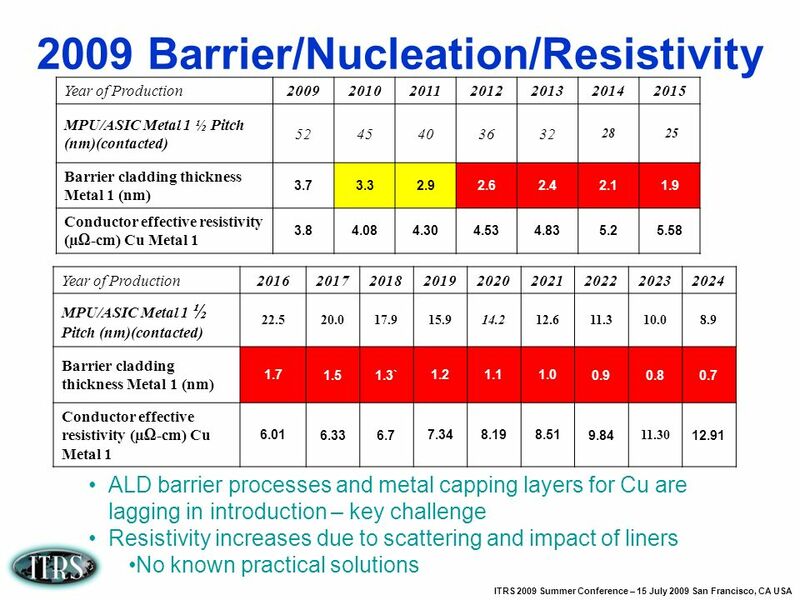 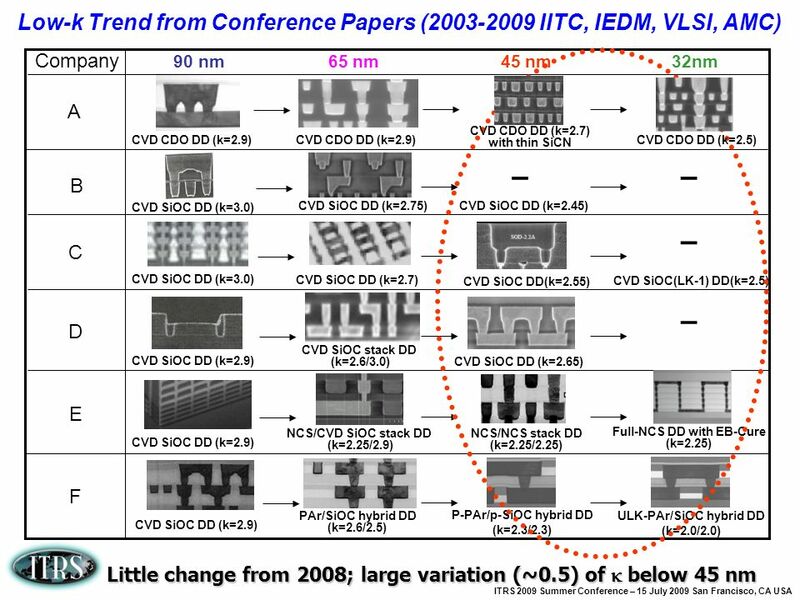 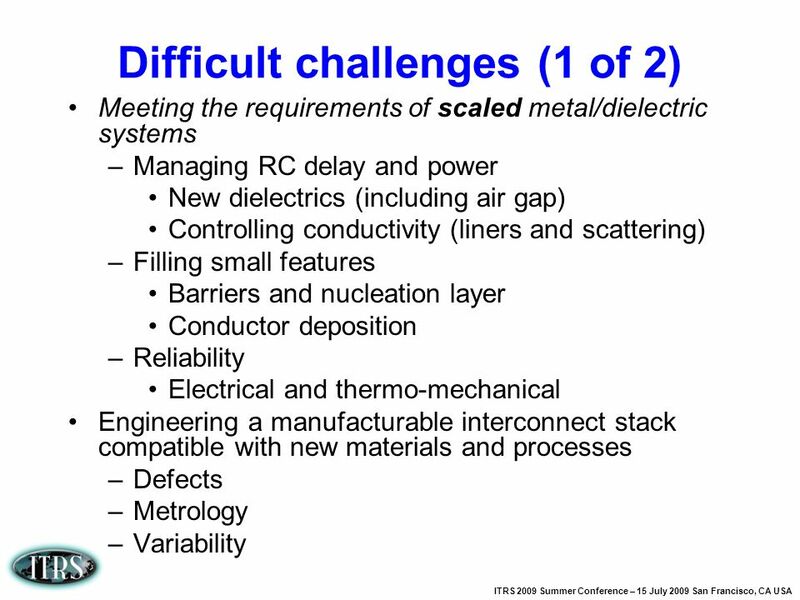 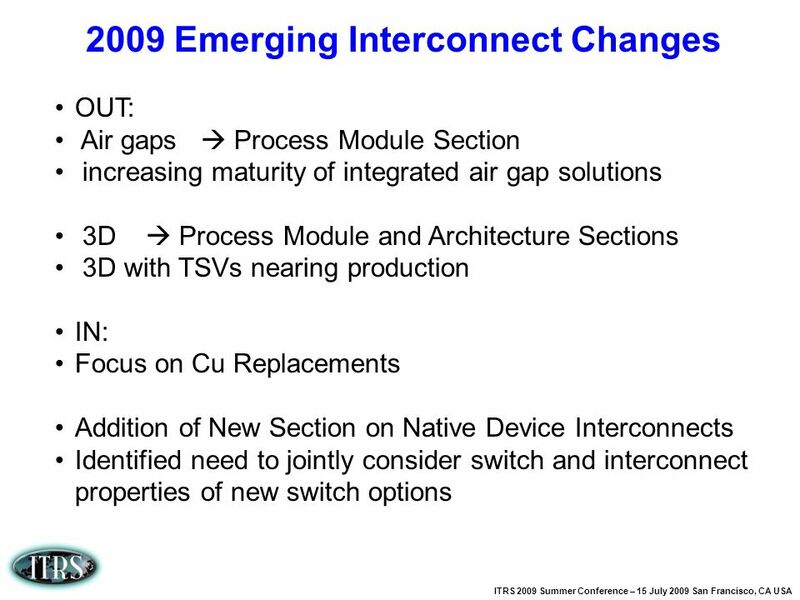 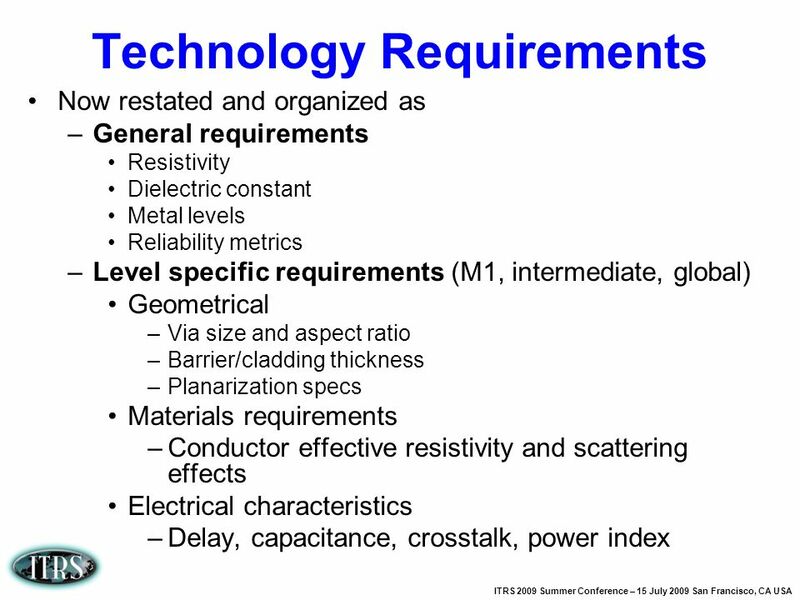 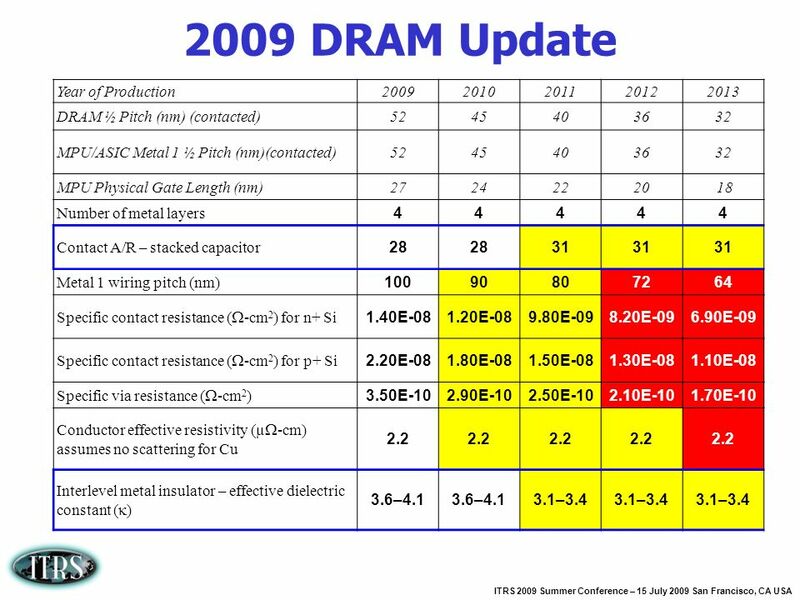 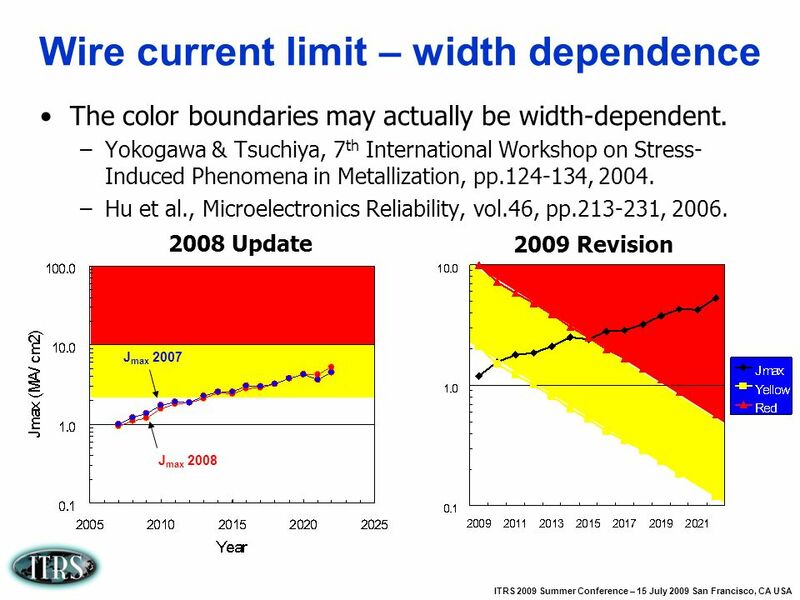 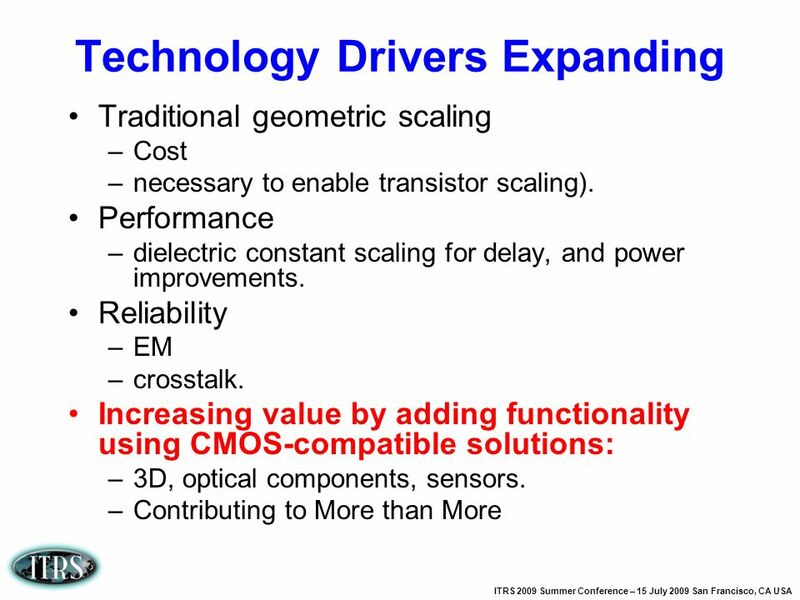 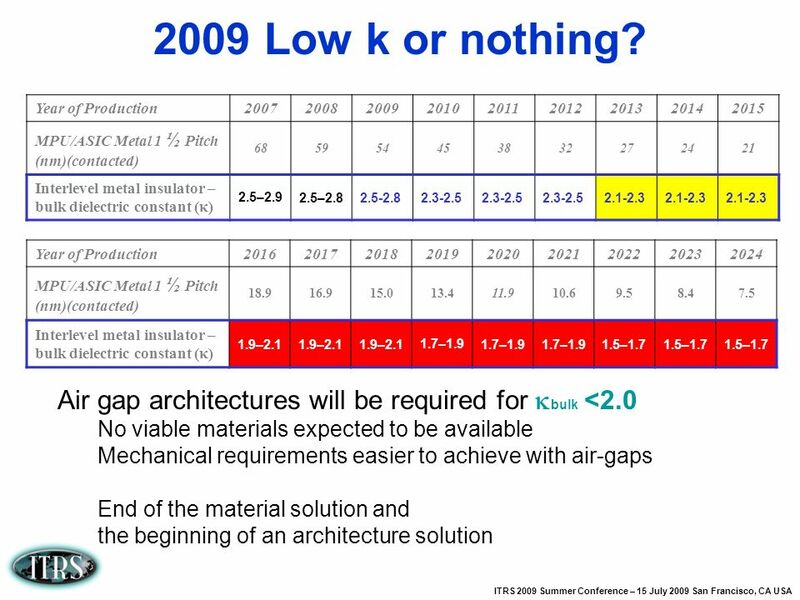 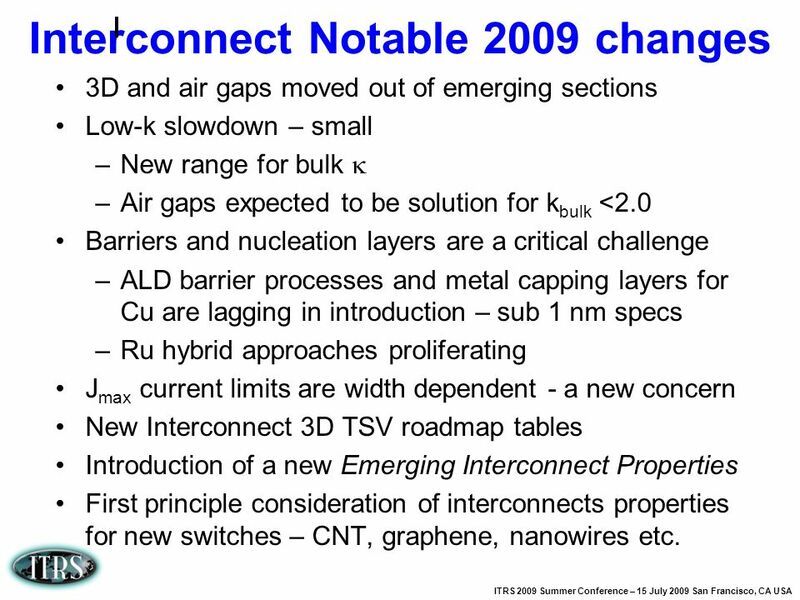 3D and air gaps moved out of emerging sections Low-k slowdown – small New range for bulk k Air gaps expected to be solution for kbulk <2.0 Barriers and nucleation layers are a critical challenge ALD barrier processes and metal capping layers for Cu are lagging in introduction – sub 1 nm specs Ru hybrid approaches proliferating Jmax current limits are width dependent - a new concern New Interconnect 3D TSV roadmap tables Introduction of a new Emerging Interconnect Properties First principle consideration of interconnects properties for new switches – CNT, graphene, nanowires etc. 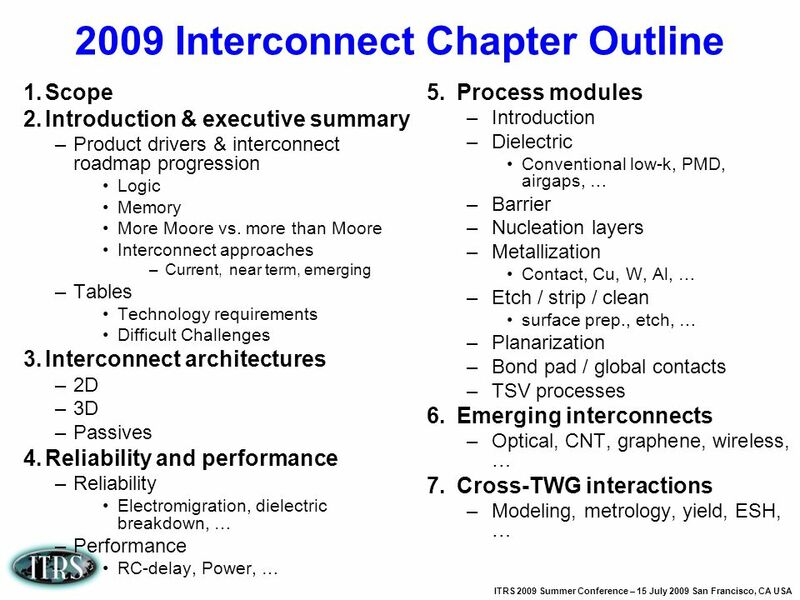 Download ppt "Interconnect Working Group"
Work in Progress --- Not for Publication 26 April Interconnect Working Group ITRS April 2001 Grenoble. 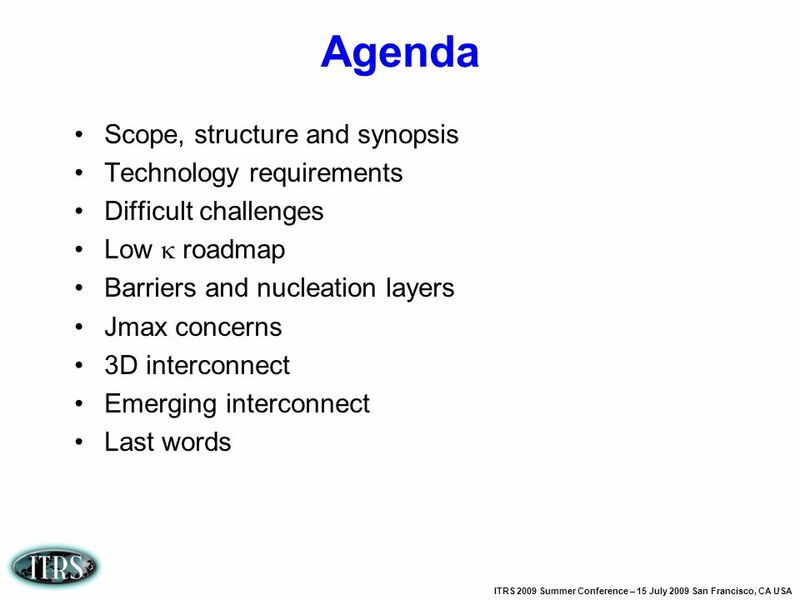 April 26-27, 2001 Ed Hall Work in Progress – Not for Publication Modeling and Simulation TWG Attendees Wim ShoenmakerEurope Gilles Le CarvalEurope Herve. 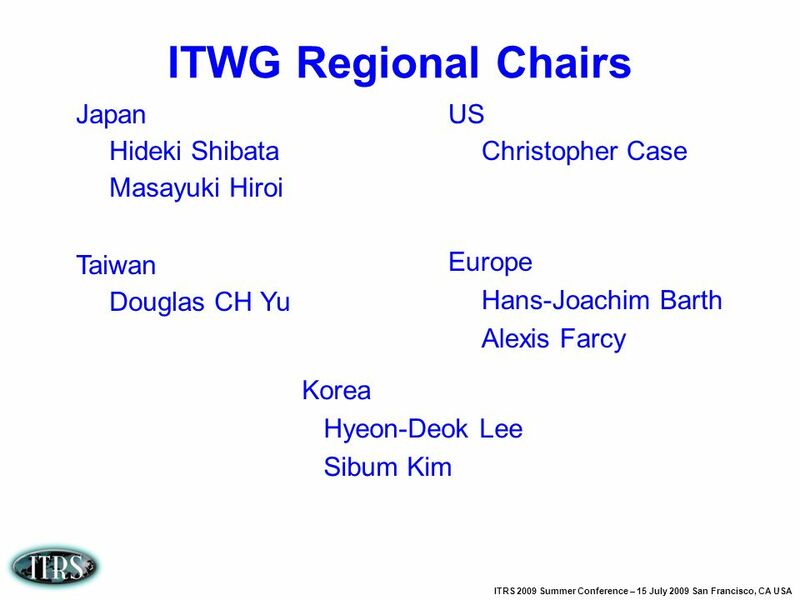 Work in Progress --- Not for Publication Japan Taiwan US Ken Monnig Christopher Case Europe Hans-Joachim Barth Dirk Gravesteijn Korea ITWG Meeting. 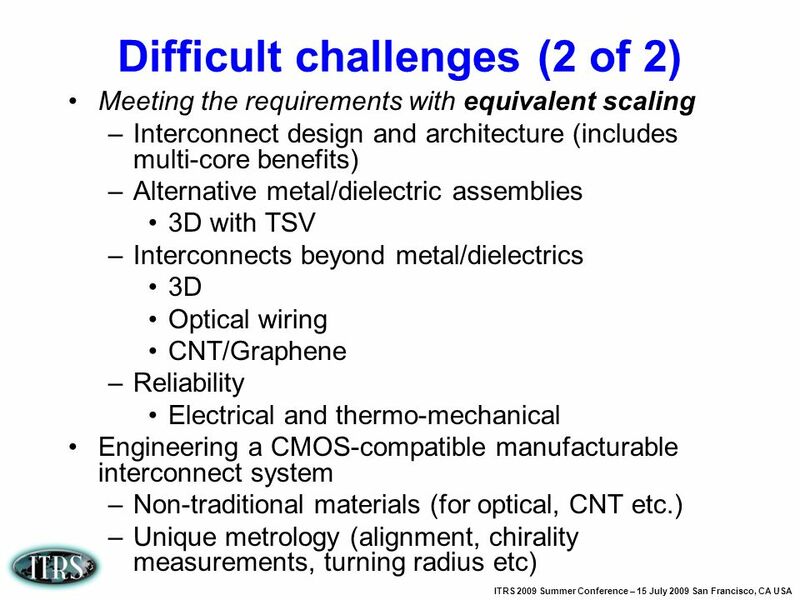 Modeling and Simulation TWG Hsinchu Dec. 6, Modeling and Simulation TWG Paco Leon, Intel International TWG Members: I. Bork, Infineon E. Hall, Motorola. 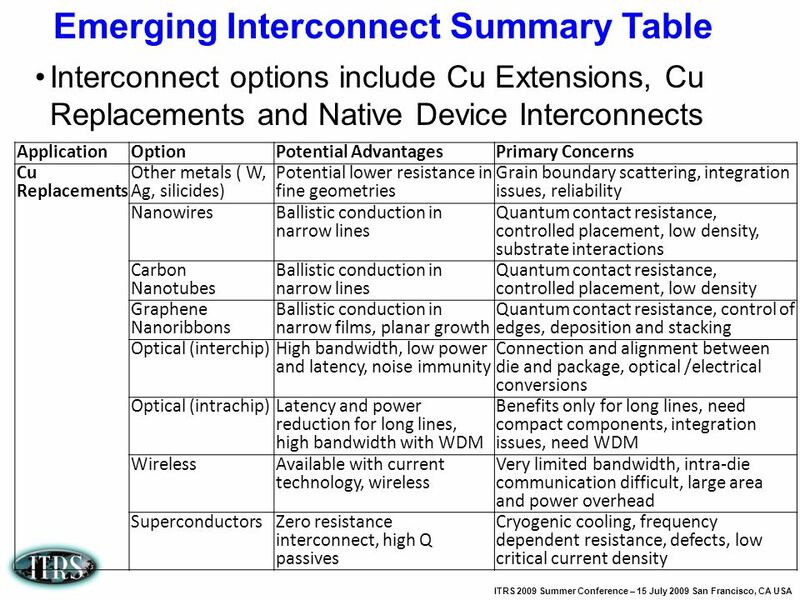 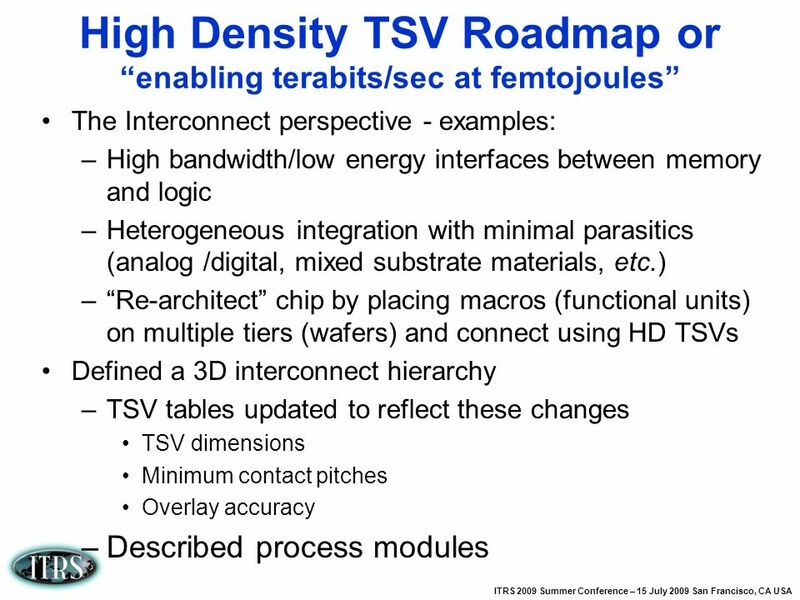 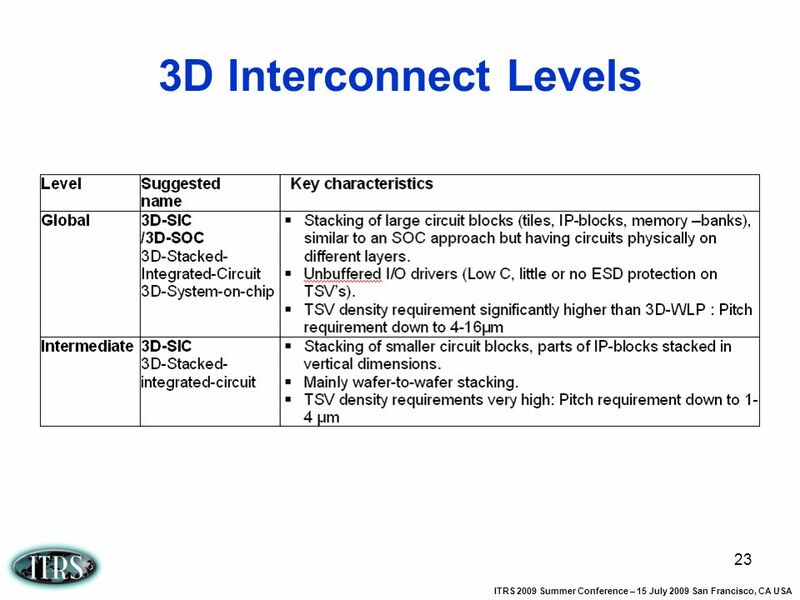 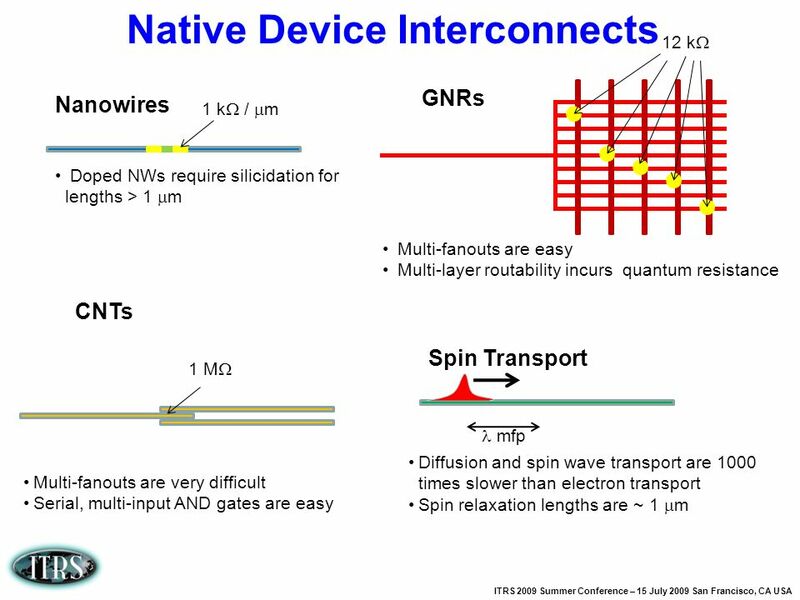 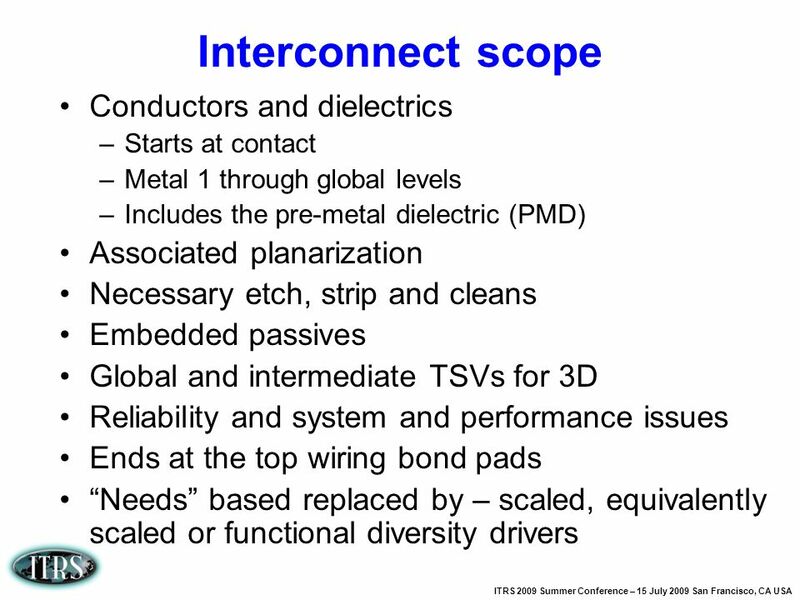 Slide Interconnect Update –Mandeep Bamal –Christopher Case –Alexis Farcy –Robert Geffken –Dirk Gravesteijn –Harold Hosack –Mauro Kobrinsky –Tomoji. 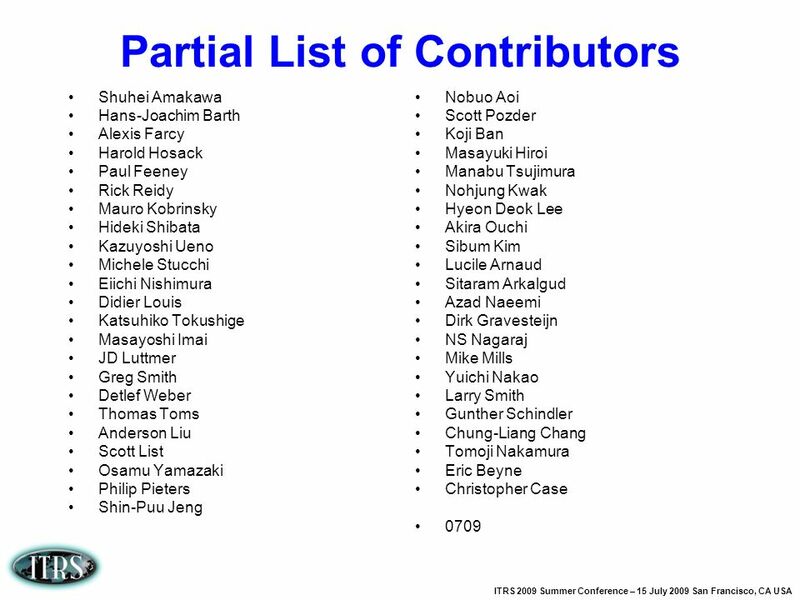 Work in Progress --- Not for Publication Japan Shinichi Ogawa Akihiko Ohsaki Taiwan Calvin Hsueh Shin-Puu Jeng US Robert Geffken Christopher Case Europe. 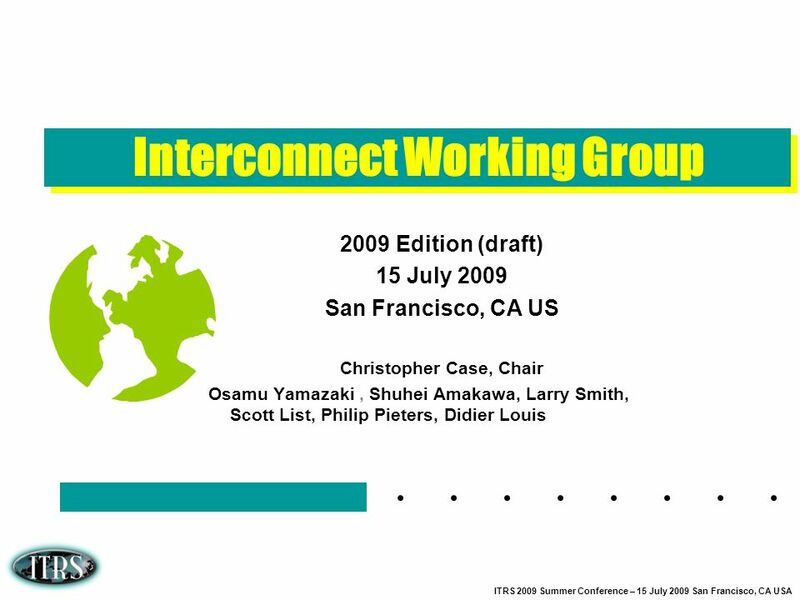 (not for publication – work in progress) ITRS Summer Conference 2009 San Francisco 1 Front End Processes 2009 ITRS ITRS Public Conference July 15, 2009. 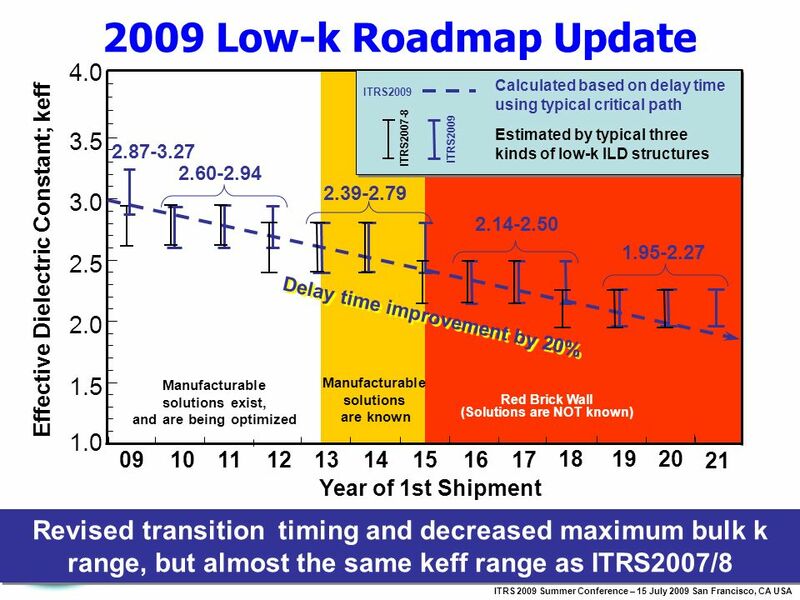 2 December 2003 – ITRS Public Conference Tsinchu, Taiwan ITRS 2003 Front End Process ITRS Conference December 2, 2003 Hsinchu, Taiwan. 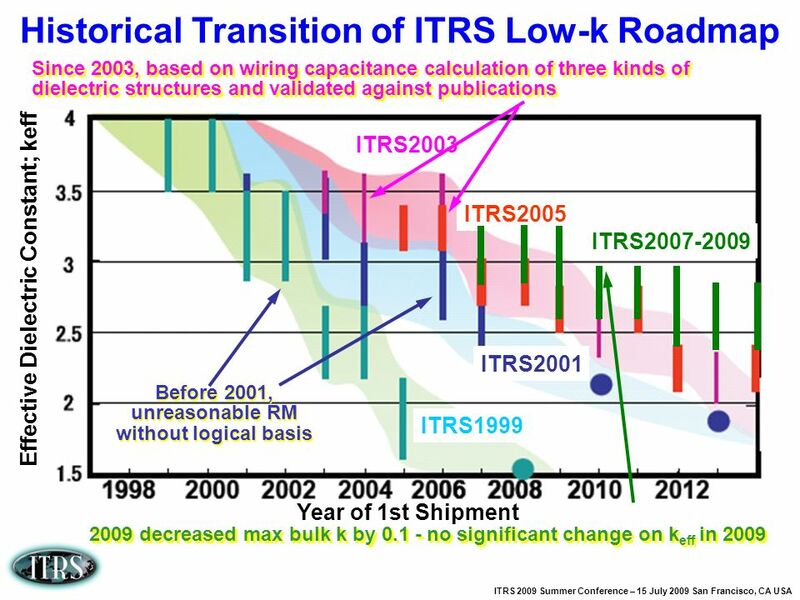 Work in Progress --- Not for Publication 6 December Interconnect Working Group ITRS 2000 Lakeshore Hotel, Hsinchu, Taiwan, R.O.C. 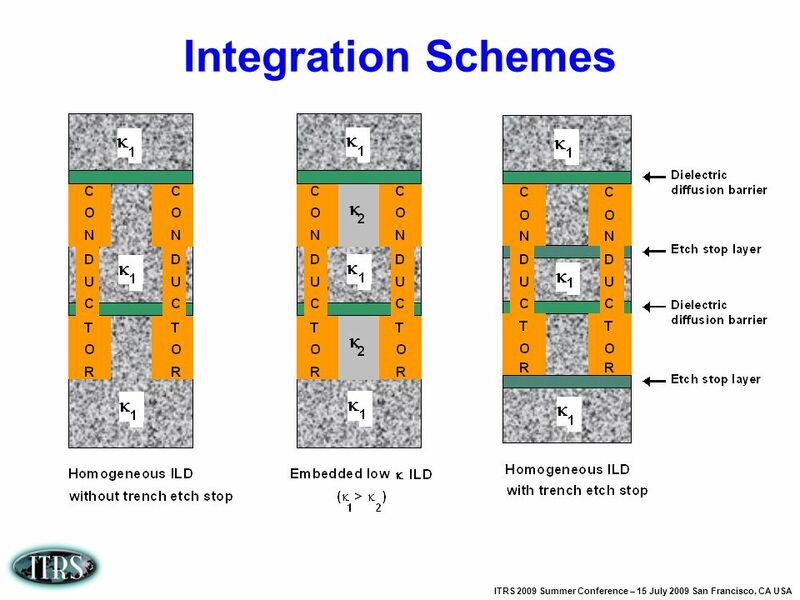 6 December 2000.